From 1992 to 1997,we can not meet the requirements of increasing customers because of our outdated equipment.In 1997,we introduced advanced equipments and production process from Taiwan, with the advanced equipments and professional staffs,our annual production has grown to 35 million meters. There is strict control in producing process by our professional engineers to ensure that all the products meeting standard requirements.The quality control is carried out in our own technical department,because of the advanced and exact technique,our products are recognized by China Union of Construction Metal Struction. 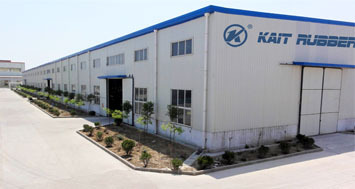 Our equipments and production process were introduced from Taiwan in 1997,including assembly line of four-extrusion, tri-extrusion and single extrusion, and 21 sets of press vulcanizer.We have our individual mode of production,such as raw material collected,new moulds exploited and finished products completed. million capital assets and 86 million current assets.With the excellent quality and experience,we have got many certificates of honor,such as “Honor Credit and Promise” enterprise and “Star Enterprise”and so on. we will insist on the principle of mutual benefit and common development base on people oriented and quality first.And we will provide excellent sealing products to our customers continuously.